Azodyl clears toxins in the bowels through a patented formulation of natural, beneficial bacteria (Kibow Biotics®) that support kidneys and renal health. This supplement should be used in pets with chronic kidney disease to reduce azotemia, build up of non-protein nitrogenous compounds which impair the kidney's waste elimination process. Azodyl reduces azotemia, metabolizing and flushing the bowel of uremic toxins. Azodyl helps slow the progression of kidney disease or chronic renal failure. Pets with kidney disease should follow a low phosphorus diet recommended by your veterinarian. Make sure your pet always fresh drinking water. 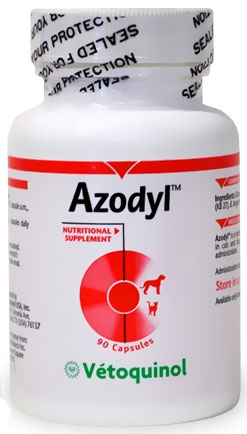 Azodyl is safe to use with other kidney therapies and can be used in any size dog or cat. Capsules should not be opened or crushed, but given whole with food or treats. Pets up to 5 lbs should receive 1 capsule daily. Pets 5-10 lbs should receive 2 capsules daily, 1 in the morning and 1 in the evening. Pets greater than 10 lbs should receive 3 capsules daily, 2 in the morning and 1 in the evening. Keep refrigerated for best results. How Do I Keep Azodyl Fresh? We get a lot of questions from customers about how we ship this product, and how to keep it fresh afterward. Everybody's heard that it needs to stay cold. But what do purchasers of Azodyl really need to know?